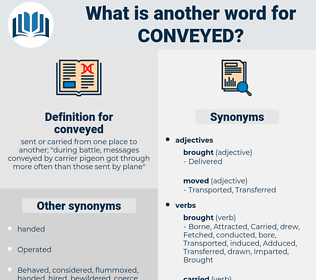 What is another word for conveyed? 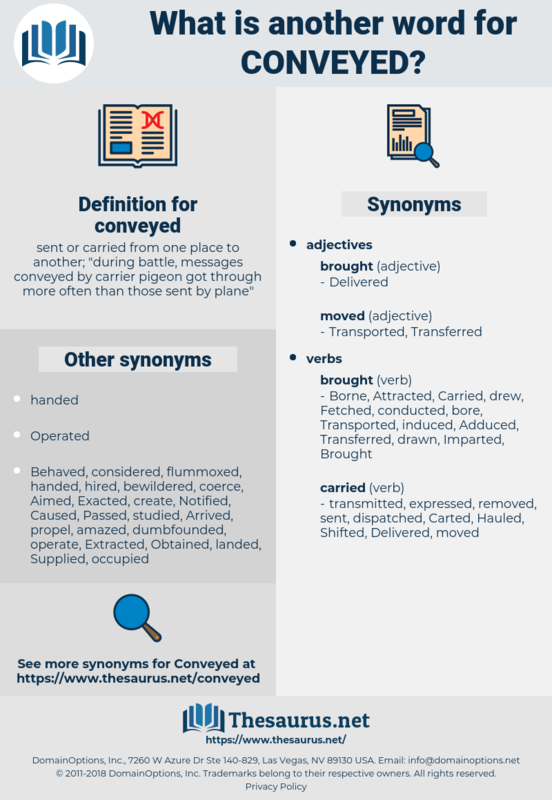 sent or carried from one place to another; " during battle, messages conveyed by carrier pigeon got through more often than those sent by plane"
communicate, Communicated, Corresponded, come, Came, indicates, demonstrated, communication, confiscated, Commented, Contributed, articulated, illustrated, disseminate, contained, Disseminated, information, dissemination, conceded, voiced, conferred, acknowledged, Explained, express, expressed, expresses, Echoed, transmit, transmitting, ascertained, recovered, reflected, described, Complained, covered, outlined, Contended, disclosed, Introduced, portrayed, sent, sends, Delivered, inspired, inspiring, contact, contacted, Testified, anticipated, distributed, signified, signify, removed, destination, circulated, identified, delineated, appreciated, Propagated, announced, reminded, summarized, Mentioned, Transported, instructed, highlighted, revealed, Petitioned, transposed, Pertained, Vacated, recognized, exposed, awareness, criticized, address, addressed, Told, referenced, relocated, conducted, defined, move, moved, Manifested, Transferred, Transferring, noted, advised, collapsed, Extracted, Rendered, lent, suggested, initiated, Deployed, promulgated, presented, received, exchanged, Notified, formulated, thanks, Thanked, included, broadcast, broadcasts, broadcasted, forward, forwarding, forwards, directed, vehicle, dispatched, Replied, relayed, increased, Warned, declared, postponed, Imparted, Devolved, elaborated, Issued, Protested, touched, nominated, knowledge, dispersed, implied, proceed, surrendered, Captured, assigned, signalled, provide, Provided, Channeled, Channelled, Proffered, Reached, Envisaged, spoke, Submitted, Offered, attested, projected, Promoted, Wrote, entrusted, donated, Referred, diffuse, furnished, Challenged, affirmed, stressed, asserted, showed, effected, Obtained, treated, pledged, centred, handled, pointed, published, Stipulated, Divested, Carried, processed, Appealed, Yielded, Displayed, centered, mailed, Voted, unveiled, Deposited, Ceded, Undertook, spread, alerted, Arrived, Quoted, established, Brought, Phrased, expected, Performed, briefed, briefings, uttered, Cited, Remanded, Exhibited, exhibits, alleged, Incurred, bore, Served, focused, focussed, said, seized, Gave, liaised, plotted, crossed, Supplied, prepared, Migrated, Streamed, streams, Prompted, left, Tendered, intended, laid, mirrored, Passed, Filed, Flew, release, released, sold, skip, turned, granted, featured, Drafted, Meant, credited, Launched, share, shared, Pushed, part, led, mandate, handed, Approached, exhausted, Summed, Remitted, Shipped, Returned, charged, Embarked, held, aired, Resulted, Visited, put, travelled, Dealt, Wished, Hauled, cast, planned, Shifted, admitted, posted, Fielded, rushed, Looked, Argued, Regarded, bowed, Attacked, Entered, blamed, Marched, raised, Flaunted, failed, Slammed, stated, Took, Talked, Ran, tipped, da, Claimed, called, Awarded, tabled, pulled, Did, let, shed, made. Communicated, articulated, enclosed, Disseminated, voiced, expressed, disclosed, sent, Delivered, contracted, contacted, distributed, evacuated, removed, copied, circulated, advertised, extended, Transported, redirected, redeployed, Told, relocated, moved, Transferred, Divulged, disposed, presented, received, exchanged, Notified, reassigned, Progressed, broadcast, broadcasted, directed, dispatched, diverted, hospitalized, relayed, Imparted, escalated, Issued, taught, Apprised, surrendered, withheld, assigned, Ferried, Provided, Channeled, Channelled, inherited, Submitted, Referred, furnished, cascaded, Trafficked, Carried, Adduced, Deposited, Ceded, spread, Quoted, Brought, Borne, fed, Lodged, uploaded, downloaded, Supplied, Beamed, assumed, Migrated, Flown, vested, Passed, Filed, released, sold, Leaked, turned, routed, shared, handed, lost, Approached, Remitted, Shipped, Returned, aired, airlifted, Shifted, admitted, rushed, Piped, stated, taken. There was shouting and singing, but little of this conveyed itself to Phil, for his mind was on other things. How was it conveyed down to us? compote, Confit, combat, cyanophyte, confide, comb-out, come about, combed, cohune fat, camp out, canopied, chickenfeed, cambodia, cynipidae, comb out, come up to, cyanophyta, confute, confetti, common beet, compute, cymbid, cenobite, common fate, chicken feed, camp bed, connive at, compete, comfit, chimneypot, coenobite.